India has made considerable development in all areas. Paternity testing in India was never imagined to be so easy. With the setting up of collection centers for DNA Test in Jammu & Kashmir, many problems can be solved by a simple DNA test. DNA testing in Jammu and Kashmir has gained popularity since it has helped in cases where there was no hope. Several collection centers have been opened by DDC Laboratories India in Jammu and Kashmir for the convenience of the clients. 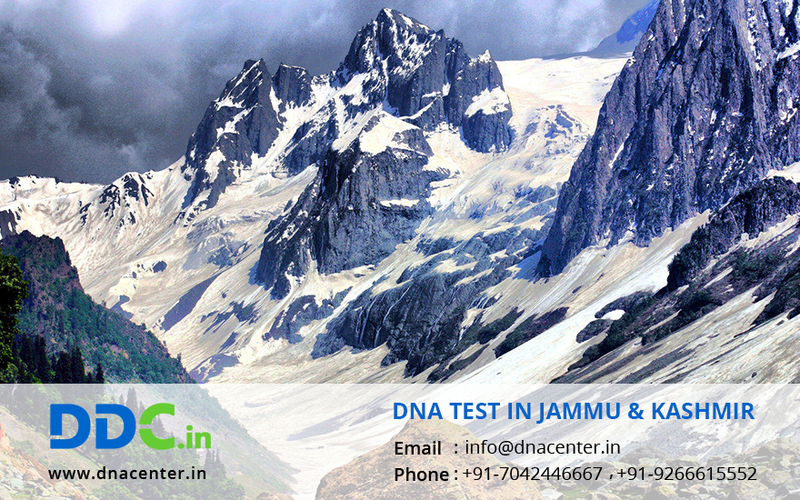 DNA testing is now available in Jammu, Udhampur, Katra, Anantnag, Srinagar, Baramulla and Leh. People can get Maternity DNA test, Paternity DNA test, Relationship DNA test and Ancestry DNA test done with ease. We also offer online DNA testing kits for at-home collection with the same result as of legal DNA tests. You can buy sampling kits online, follow instructions to collect an own sample and send back to the nearest collection center for analysis. Our staff includes a few of the nation’s most experienced and reputed scientists, technicians and lab assistants. We are well-equipped with the latest technology and certified as AABB for our testing lab. You can expect accurate, professional and reliable test results by our DNA test specialists. For DNA Test in Jammu & Kashmir, you can give us a call at: 7042446667 or whatsapp us on 9266615552 or please fill the below given form and our customer representative will get in touch with you as soon as possible.